Looking for an inexpensive way to teach music-reading? Can't afford an expensive instrument? Don't know how to read music yourself? Let Marcia show you how anyone can learn to play the soprano recorder. This is an introductory book--even easier to use than the beginner books you see in the music stores and online. Every step is clearly described so even non-musicians can easily teach their children to play. 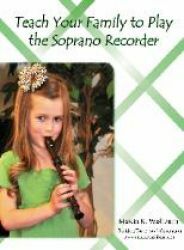 Teach Your Family to Play the Soprano Recorder is based on Marcia's method of teaching groups to play the recorder. She gives you the precise words that she uses in her classes so you can easily teach your children in your own home. "One of the best ways to learn to read music is to learn to play an instrument. The soprano recorder provides an excellent vehicle for this purpose. In addition to being inexpensive (usually well under $10), the plastic models are virtually indestructible and have a pleasant tone. "The recorder is an excellent pre-band instrument, but is also a serious instrument in its own right. Many of the classical composers wrote music for solo recorder and recorder consorts (ensembles). The recorder was especially popular during the Renaissance and Baroque periods of music history. "The recorder is a simple instrument to learn and is suited to children even as young as nine years old if their fingers are long enough to cover the holes. Best of all, even a parent who does not read music can learn to play the recorder and teach her family. "Over the years, I have taught dozens of parents and children to play the recorder. Typically, I meet with the parents for about one hour to get them started. This is the only class they take with me. Many of these parents have never read music before, but by the end of the class, they are confident that they can teach their children what they have been taught. "After our class, the parents teach their children at home for about fifteen minutes each day. Within three weeks they are ready to play a few pieces for friends and relatives and they typically do a nice job. "Some of the students have gone on to play much more challenging recorder music. Others used it as a springboard to playing other instruments. They found that the music-reading skills they learned in those brief weeks carried over to the other instruments beautifully. "The instructions are written as if you are teaching more than one child at the same time. You may find that you do not need as much structure to the lessons as I give here, especially if you are working with older children or those who already read music."